It was over a hot bowl of pho (beef noodle soup) in the Little Saigon shopping center outside Washington, DC that the idea sparked: we need to take a trip to Vietnam! Based on the food alone our honeymoon destination practically chose itself. 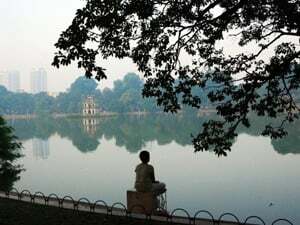 To many Americans, going to Vietnam is kind of shocking, as most people think of it as an underdeveloped country still recovering from the war. But hey, we're not your average stay-put couple that goes to traditional places. I'm a diplomat and Luis owns his own business, so we rack up the frequent flyer miles and have lived all over the world for most of our lives. After spending time in the Dominican Republic (Luis' home) and Spain (my home) and then being posted in Venezuela and Tunisia, we've had our share of beautiful white sand and Mediterranean beaches. 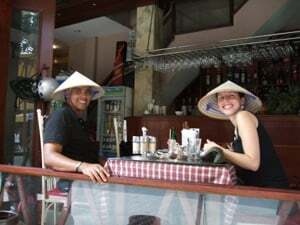 Instead, we opted for what we thought would be a culinary and cultural adventure of Vietnam! Luis had never been to Asia, and although I traveled some when I studied abroad in Hong Kong in college, I'd never been to Vietnam and always wanted to go. The honeymoon was not planned before the wedding (shocking!). When you get married in Madrid at the National Cathedral (Catedral de la Almudena) and then plan at a reception at an old 16th Century Abbey, and you do all this while moving from Washington DC to Tunisia and starting a new job, it was just too much to handle. Instead, we went on our honeymoon six months after our wedding (October 2009). We planned the whole thing online, without travel agents and armed only with recommendations from friends and trusted websites. The result was the most amazing trip either of us has ever taken! Surprisingly, our honeymoon was dirt-cheap. We visited my parents in Tucson, AZ and flew from there for only $700 round trip per person, via Tokyo. Vietnam itself was also dirt cheap, with the whole cost of the actual trip (including five-star hotels, food, and a luxury cruise) for about $1500 for 10 days. We kid you not! We shopped galore, ate seafood the entire time, got massages, and basically did everything we wanted to without looking at price tags. Traveler's Joy was "the bomb" – we've been living together forever and didn't need more stuff, so registering for a honeymoon trip was perfect. It bankrolled our stay and allowed us to have an amazing experience! On our 10-day trip we managed to enjoy every type of transportation known to man – we walked, rode in cars, trains, buses, boats (big and small), planes, ferries, and even buses on ferries. We never stayed at the same hotel more than one night, and were always on the move. Our trip took us to north and south Vietnam, near the Chinese border, to magical Halong Bay, and down to the Mekong River delta. The trip started in bustling Ho Chi Minh City (also known as Saigon) – we arrived at night after 20 hours of plane travel to a hot, sweaty and noisy South Asian metropolis where our first impression was how insane the 10,000 motorbike traffic was. We arrived at the super swank Caravelle Hotel and were received in instant luxury (even a fondant cake with our names appeared in the room upon our arrival!). Ho Chi Minh City was a pleasant surprise – a city full of great restaurants and funky shopping (Ben Trahn Market was our favorite). We trotted all along the city visiting war museums, old pagodas, and hip coffee shops. We spent one other night in Ho Chi Minh City on our way back home, at the amazing Hotel Majestic, an art-deco hotel from the 1920's which has been restored to its original elegance. The hotel itself was aesthetically beautiful, but we give it major props for its personalized cooking classes! For $50 we took a 3-hour Vietnamese cooking class and learned how to make all sorts of delicious haute Vietnamese cuisine dishes like steamed prawns with fresh coconut and crab-lobster spring rolls (I'm writing a cookbook right now so this was perfect!). Our next stop was Hanoi in the north, where we stayed in a great boutique hotel called the Green Mango, which was recommended by a diplomat friend who served in Hanoi. It was nestled in the Old Quarter, a neighborhood with windy streets and a constant flurry of motorbikes, pedal bikes, and people carrying wares and snacks on two baskets connected by a bamboo stick. We saw a pagoda in the middle of a lake, walked around some open-air markets (where we saw some wacky food like boiled dog! ), caught the whole city of Hanoi out on the streets exercising early in the morning, and bought ourselves a silly barrage of accessories (watches, sunglasses, Ho Chi Minh t-shirts, silk purses!) at cents on the dollar. By far the highlight of our trip was a cruise to Halong Bay. If you've ever seen the movie Indochine (with French actress Catherine Deneuve), it was filmed here. An emerald bay with rock formations that jut out majestically into the misty sky, it was a really a sight to be seen. We took a one-night cruise with Indochina Sails (operated by Cruise Halong), a luxury cruise company – at $400 a night it was the splurge of the trip but totally worth it. We have to give a shout-out here to www.i-escape.com, a great website that showcases boutique hotels all over the world – their recommendations have always been spot-on and this is how we chose the company. 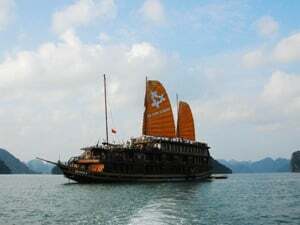 Our ship was the Halong Jasmine, a 30-cabin junk decorated with old teak wood, oil paintings, and luxurious fabrics. Our room had huge windows and a comfy bed, where you could relax and just watch the majestic scenery go by. This, coupled with candlelit dinners, great seafood, treks to a cave and floating fishing village, topped off with evenings on the deck with a nice glass of wine … this is what honeymoons are all about! Another memorable experience was a trip up near the Chinese border to Sapa, Vietnam. This is the area of Vietnam where minority populations live. To get there, we crammed ourselves into a four-bed cabin on a night train from Hanoi (hilarious because the wake-up call for arrival is a very loud Chinese opera song blasted through the loudspeakers). Nestled up in the mountains among rice paddy fields was Topas EcoLodge, an eco-friendly hotel that overlooks the amazing northern Vietnam landscape. We stayed in a little bungalow with a private balcony – all you could hear was the buzzing of insects, the sounds of the raging river below, and the enveloping silence of nature. Back in the actual town of Sapa you could see many members of the ethnic minorities dressed in their traditional wear, with bold headdresses in bright colors, funky jewelry, and intricate textiles. At this point in the trip I got pretty "local" and decided to eat street food right in the market where the foreigners never venture – Luis almost fainted when I ate here but to Vietnam's credit, not once did we get sick to our stomachs! Even when the menu item was steamed worms, grilled eels, dog, or other undecipherable ingredients! Overall Vietnam was an amazing honeymoon destination. It's off the beaten path, so unlike Thailand, you're not hit with a wall of mass tourism and a culture that has bent itself around catering to tourists. Vietnam is safe, the infrastructure pretty developed, and cheap enough that you can play it by ear and spend a little more on side items without breaking the bank. There are nice beaches in Vietnam, and many travelers choose that route on their visit, but we chose to see the urban and mountain sights instead. It's a beautiful country – with amazing food, fun people, and full of culture and activity.